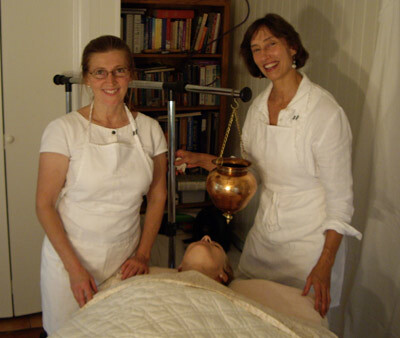 Charlotte is a certified practitioner with NAMA (National Ayurveda Medical Association). She has over 1700 hours of Ayurveda study consisting of lectures, practicum, clinical observation and Sanskrit with Dr. Vasant Lad since 1991, including participation in over 900 client consultations. For the past twelve years she has worked with hundreds of clients in her private practice using diet, culinary and medicinal herbs, yoga, and the hands-on therapeutic modalities of Ayurveda including administering Purvakarma and Panchakarma. She completed intensive clinical studies in India with Dr. Lad in Pune and Dr. Sunil Joshi in Nagpur. In addition, she has more than 1000 hours of study of classical Jyotish and Vastushastra with the renowned Hart de Fouw. She is a graduate of High Desert Yoga Teacher's Training and taught Yoga from 1997-2004. Charlotte is an accomplished vegetarian chef and teaches “Cooking and Eating for Health and Vitality” according to the principles of Ayurveda. "Since 1991, I have studied the Vedic arts and sciences of India. Yoga and Ayurveda have both received great acceptance in the west and the complimentary disciplines of Jyotish (Vedic Astrology and Hand Analysis) and Vastu Shastra (Science of Living Spaces) are not far behind. These crafts have all been successfully applied to enhance the quality of life for thousands of years. My professional experiences continue to validate the powerful benefits of these ancient tools when ap	plied to today’s living." Shakti Sarkin has over 25-years of experience in health therapeutics which include a variety of modalities. Currently she primarily works with trigger points, myo-fascial release, Chinese organ massage, Ayurveda Snehana, Swedana and Shirodara as well as traditional Swedish massage and chair massage. Peggy Kelley, Director of Austin Yoga Institute and Austin Yogaveda, is certified to teach the Iyengar method of Hatha Yoga, and is a teacher trainer and assessor in the Iyengar community. She taught Yoga first in Canada and then in Austin after moving here in 1976. Her love of Ayurveda dates to her first trip to India to study with Geeta Iyengar in 1989. Geeta is an Ayurvedic doctor, as well as a Yoga teacher in the tradition of her father, B.K.S. Iyengar. Peggy opened the Austin Yoga Institute in 1992, and began studying Ayurveda soon thereafter. She studied first in North Carolina with Swamini Maya Tiwara, then with David Frawley, and finally with the Ayurvedic doctors on the faculty of the American Institute of Ayurveda, which certified her as an Ayurvedic practiitoner in 2003. Eileen Press, M.D. is a retired physician. She has been practicing Yoga, Pranayama, and meditation for the last twenty-eight years beginning in 1980 when she lived in India. She received her M.D. degree from the University of Texas Southwestern in Dallas in 1992 and was a surgical pathology resident at the National Institutes of Health. She then worked in the biotechnology industry, focusing on stem cell research. Eileen is certified in 500 hours of ayurvedic study with David Frawley from the American Institute of Vedic Studies and 200 hours of hatha yoga from Focal Point Yoga. Eileen is successfully married for 21 years. Her husband is a molecular biologist and student of yoga. Together they have two grown children, who are the ultimate teachers of right action, ahimsa, patience, forgiveness, and living in the now.